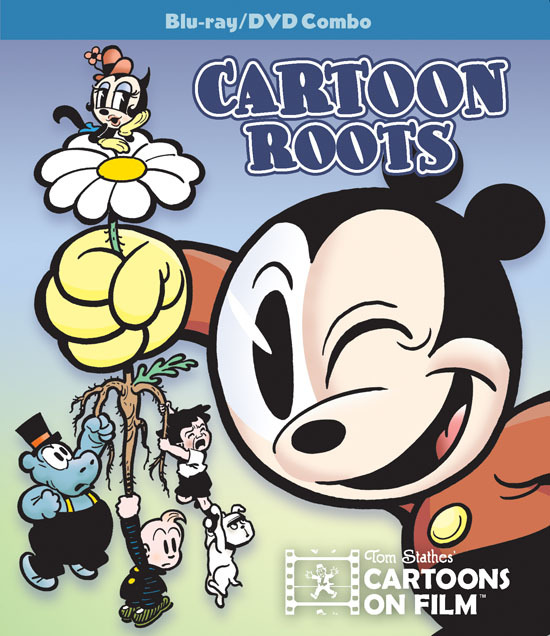 As Cartoon Researchers, what might ‘Cartoon Roots’ mean to you? For me, it has a double meaning. Firstly, it’s the title of my brand new (and first!) 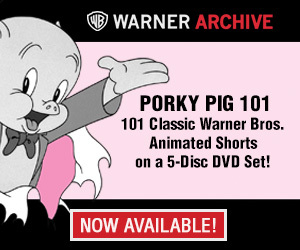 Blu-Ray/DVD combo release of early animated cartoons from the silent and early sound period. You’ll learn much more about that exciting news in just a moment. 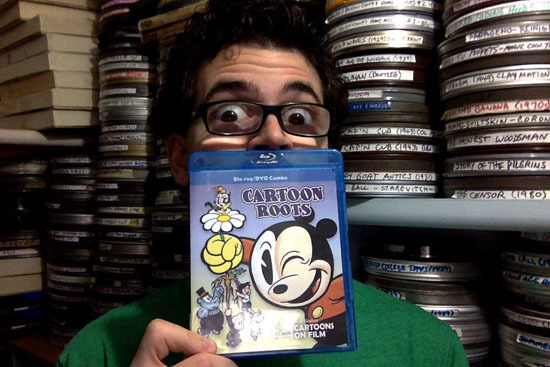 On a more personal note, ‘Cartoon Roots’ reminds me of my own beginnings with the art form of animation and my love for it. 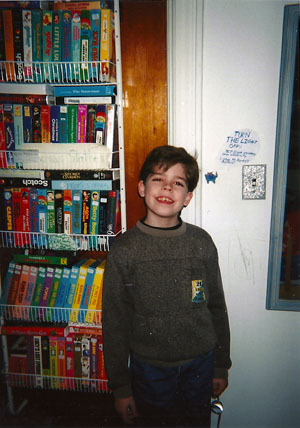 I grew up in the 1990s, during the strong years of VHS home video releases of classic films and animation. My own Cartoon Roots, as it were, could be traced back to two seemingly incompatible but thoroughly enjoyed VHS collections: the official Disney VHS of Fantasia, which is a film I’m told I have enjoyed since the age of three days; and an unlicensed, dollar bin cartoon tape containing the only two public domain Mickey Mouse cartoons: Minnie’s Yoo Hoo (1930) and The Mad Doctor (1933). The latter tape also contained Mickey rip-offs in the form of the Warner Bros. Foxy cartoon Smile, Darn Ya, Smile! (1931) and Van Beuren’s Circus Capers (1930). Strangely enough, it would be the inexpensive public domain tapes, containing oddities such as these and more mainstream Golden Age classic animation that truly fueled my interest in animation and its history. Throughout those early years, I would often draw my own covers for hypothetical public domain cartoon VHS releases, as well as write out long lists of tapes that I myself would release containing three or four shorts each. I wanted to be a distributor and producer of the kind of product I was buying and enjoying so much as a kid. Years later, and after much work in film archiving, collecting, and rare early animation unearthing, I’m truly proud to finally be honoring the dream through the first of my very own professional home video releases…in high definition! And of far more obscure, rare, and unique material than any of what I would buy at the drugstore or supermarket as a kid for $2, much as I still love the material I enjoyed then. You read that right: a Romer Grey cartoon!! 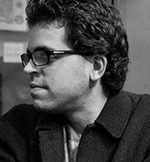 In addition to these films, there are also many fine extras curated by the inimitable David Gerstein, and many of the silent-era films feature new music composed by accompanists Robert Israel and Ben Model. Early animation ally and noted artist Stephen DeStefano drew the lovely line art for the packaging – which I just love. It’s also essential to mention that this release would not have been possible without the HD film transferring expertise, digital restoration know-how and Blu-ray building skills of our very own Steve Stanchfield and his assistants. We’re also incredibly grateful to the Library of Congress and their staff, as some of the films (such as Scents and Nonsense as well as Hot-Toe Mollie) and a few of the extras were sourced from their collections. Col. Heeza Liar, Detective is sourced from a Stathes Collection 35mm nitrate print found in Spain, also lovingly preserved by the Library of Congress. I’m incredibly grateful to these colleagues, who not only assisted in helping get this release up and running, but for also helping me to begin the process of sharing my early animation finds with the general public. This will hopefully be the first of many such releases. Oh, while I still have your attention: my colleagues and I still need your assistance with our Cartoon Carnival: The Documentary Kickstarter. The campaign ends on December 28th and we’ve still a long way to go. Thanks again for your support, Cartoon Researchers. See you on Kickstarter, Amazon, and in Brooklyn at my Dec. 20th 16mm cartoon screening if you’re local. I’m looking forward to buying this in the new year. Well done, Tom, Steve and all that participated in th this release (if Amazon would let me purchase the set). Otherwise, I’ll buy it through PayPal. Glad to see this is getting a BR/DVD combo release. I still haven’t made it a priority to own a BR player. And thanks for sharing what motivated you to become a distributor and producer, Tom. As a fellow collector, it’s encouraging to see someone who pursued a vocation because of their childhood hobby. Also, props to Tom and others for making the effort to include bonus materials — something that is swiftly going extinct in the studios’ push to digital. And on another note, I love that Amazon continues to credit characters as “actors” on a number of animated titles like this one. It gives me a nice chuckle. Looks like a nice dvd Tom! Looks brilliant – will it play on UK Blu Ray players? “Hot Toe-Mollie”: Romer “Reddy” Grey, brother of the famous Western novelist Zane Grey, combines two of my favorite pastimes: theatrical cartoons and late 19th- and early 20th-century baseball. “Reddy” Grey was one heck of a baseball player, and did very well in a high level minor league called the Eastern League in the late 1890s and early 1900s (renamed International League in 1912, and still with us). He got a taste of major league baseball in 1902, and was probably good enough to last much longer than that in the major leagues. According to Robert McKimson Jr.’s book about his famous father and uncles, “I Say, I Say… Son!”, Robert McKimson was much involved in the Binko cartoons, but I didn’t know that any were actually completed – until I read about it here a few months ago. just got my copy in the mail today. looking forward to watching it repeatedly. As a child of the (yes) early 1960’s when Farmer Grey, Felix the Cat and Max Fleischer cartoons were regular Saturday morning fare on our flickering B&W TV, I look forward to watching this disk compiled by a child of the 1990’s! And let me add my thanks for including DVD – I don’t have and don’t plan to acquire blu-Ray.